Even at a glance, it's plain to see that the visuals in the Forza series are swiftly approaching total photorealism - and Forza Horizon 4 cranks the graphical fidelity up further with its focus on the constantly changing seasons. But for all the gorgeous luxury cars and beautiful landscapes, I've always been fascinated by the little details that make these shared open worlds feel real without letting you take things too far. 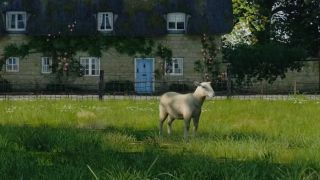 Though I swear I'm an animal lover, curiosity got the better of me, and I had to know if racers could run over the flocks of virtual sheep that mill about the open fields of Forza Horizon 4's Britain. I'm happy to report that, as with Crazy Taxi bystanders, it's actually impossible to hit the adorable livestock. "They are designed so that you can't hit the sheep. It's really hard!" laughs Ralph Fulton, creative director at Playground Games. "It's really hard to make sheep - that move in a sort of semi-believable way - foolproof in avoiding 200 mph supercars. It took quite a lot of time. But I think Ian [Moir], the engineer who worked on it for ages, did a really good job." I can attest to their smooth movements when darting out of the way of a swerving sedan; individual sheep can even break off their massive flock to dodge you just in time. Wildlife isn't a new wrinkle for the series - just look at the exotic fauna in Forza Horizon 3's Australia - but sheep can be seen all over the place, and are but one piece in Playground's monumental efforts to get the multiple seasons feeling natural. Fulton recalls that winter was by far the hardest season to get right. "That's an example of the things that just creep up on you, and winter is the worst for that," adds Fulton. "You only need to look at a fence in winter, that maybe you thought was a season-agnostic asset, and you're like 'Well, it doesn't have a layer of frost on it, the way frost gathers on the wire of a fence.' As soon as it's not there, you're like 'That's just wrong.' And the work multiplies like that. So yeah, winter was the hardest." So the next time you're zooming towards an event in Forza Horizon 4's festival and decide to take an off-roading shortcut, don't worry that you'll accidentally cause a baaaa-d accident. Ewe can't possibly collide with these even-toed ungulates, even if you're flooring it in a Lamb-orghini. For our in-depth, hands-on impressions, read up on how Forza Horizon 4 addresses the series’ three major problems.